Several waves of Sri Lankan migration have taken place since the country gained independence in 1948. Beginning in the mid-1950s, wealthy, educated, English-speaking elites have migrated to Commonwealth countries such as Australia and the United Kingdom. In addition, since the upsurge in ethnic hostilities in the early 1980s, Tamil-speaking Hindu migrants have left the country, with many settling in Canada. 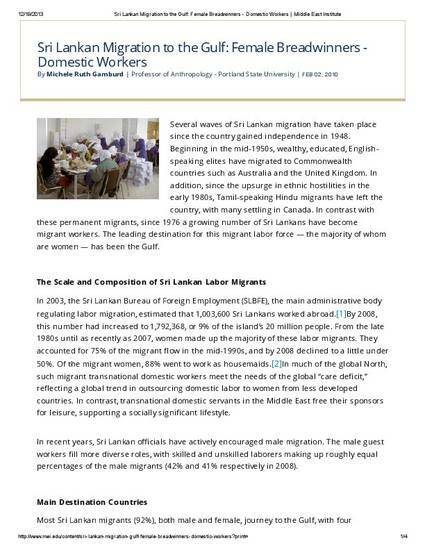 In contrast with these permanent migrants, since 1976 a growing number of Sri Lankans have become migrant workers. The leading destination for this migrant labor force — the majority of whom are women — has been the Gulf.